How you can save 24% of your tax, legally! Slightly more than half the year has gone and it is about time to review my annual financial plan. This is usually the time to consider budgets, cashflow and some tax planning for the remaining months of the year. So recently, I made a trip to CPF office to find out more details on how I could enjoy some tax relief, and at the same time, boost my retirement funds. 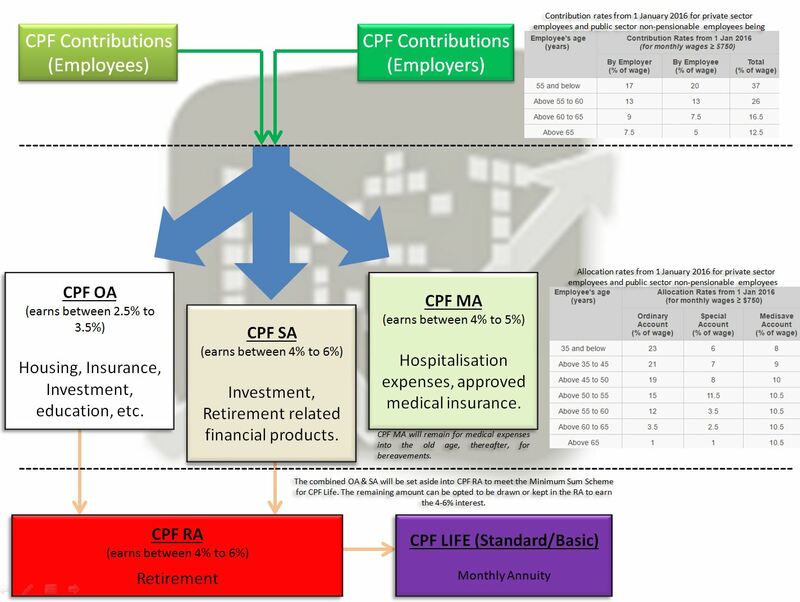 Before we proceed, let’s take a quick look at what CPF actually is. Central Provident Fund, CPF in short, is a compulsory savings plan for working Singaporeans and Permanent Residents (PR), primarily to fund their retirement. It could also be used for healthcare, education, and housing needs. Both employers and employees contribute a mandated amount to the employee’s CPF retirement fund, where it grows and earns interest between 2.5% to 5%. #For CPF members above age 55, they can earn up to 6% per annum on their retirement balances! You can find out more on the interest rates here. 1. Ordinary Account (OA) – for housing, pay for CPF insurance, investment and education. 2. Special Account (SA) – for old age and investment in retirement-related financial products. Interest for CPF SA 4-5% per annum. 3. Medisave Account (MA) – for hospitalisation and approved medical insurance. 4. Retirement Account (RA) – created when one turns 55 using the savings in OA and SA. It is set up to meet basic needs during old age. #The Special, Medisave and Retirement Account are simplified to be known as SMRA. 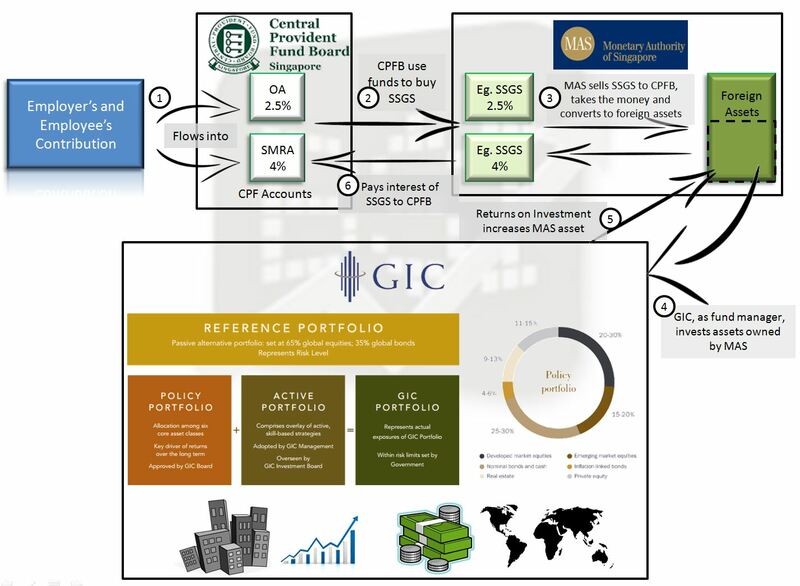 CPF monies are invested in Special Singapore Government Securities (SSGS) that are issued and guaranteed by the Singapore Government through Monetary Authority of Singapore (MAS). The proceeds from the SSGS, owned by MAS, are then managed by the fund manager: Government of Singapore Investment Corporation, more commonly known as GIC. GIC invest the proceeds on behalf of MAS. With the returns from investment, MAS pays the interest on the SSGS to CPF board. One can reduce up to $14,000 of his taxable income if he were to do a $7,000 cash top up into his CPF SA and another $7,000 combined to his loved ones’ CPF SA (parents and spouse). This means it reduces his taxable income by $14,000. Let’s put some context to these numbers. According to data provided by Ministry of Manpower (MOM), the median gross monthly income is at S$3,949, and including 13th month bonus, this translates to S$51,337 annually. This is the amount that our example 28-years old Joe is earning a year in the private sector. Joe would receive a total of $1,000 and $10,258 of tax relief from earned income* and CPF contributions** (to know more about how to reduce your tax, visit IRAS deductions for individuals here, click here to calculate CPF Contributions). His taxable income would be $40,079, and he would pay taxes of $555.53 for the assessment year of 2017. However, should Joe choose to transfer $7,000 cash into his CPF SA, he will reduce his taxable income by $7,000, to $33,079 instead of $40,079. Joe would then instead pay $307.77 in taxes. This is a 65% decrease in taxes paid. If Joe does another cash transfer of $7,000 to his wife and/or parents, he will further reduce the chargeable income by another $7,000, to $26,079. He will pay $121.58 in tax. That’s a 78% tax savings! Of course, for someone who earns the median income of $51,000 a year, to have up to $7,000 transferred into CPF SA would leave Joe cash-poor as he has to juggle the remaining $34,079 (~$2,800/month), net of CPF contributions, to settle housing and car loans, insurance, food, utility, entertainment, living expenses etc. The $7,000 top up into CPF SA can only be drawn after age 55. For a breadwinner like Joe, cashflow might be a challenge. The savings on tax might not outweigh the need for cash, especially during emergencies. Let’s explore the effects on Jack, similarly 28 years of age, who earns an average income of $6,000 a month. Working in the private sector, let’s assume Jack’s annual salary package including the 13th month would be $78,000. Jack would receive a total reduction of $1,000 and $15,600 from his taxable income due to earned income and CPF contributions. His taxable income would be $61,400, and he would pay taxes of $2,048 for the assessment year of 2017. But Jack being financially savvier, planned his cashflow and finances well, and he can afford to transfer $7,000 cash into his CPF SA, lowering his chargeable income to $54,400 instead. Thus Jack pays $1,558 in taxes, a saving of almost $500 or 24% in tax! Putting $7,000 into his CPF SA would leave him with around $62,400 annually ($5,200/month) after deduction from the CPF contributions for his living expenses. If Jack’s annual expenses are below $62,400, whatever income left sits in the bank earning a measly 0.05% interest. At the same time, Jack has to pay the additional $500 in tax. On the flip side, if he does this CPF cash top up, he would not only save $500, his cash top up in CPF would earn him an additional 4% interest, or $280 the next year. That is a $780 opportunity cost, 11% of $7,000! Hence, if the $7,000 cash top up does not put too much strain on Jack’s cashflow and finances, doing this top up seems worthwhile. This tax savings is significant. At age 28, Jack will continue to work at least another 34 years till he reaches the official retirement age at 62. Assume his pay stays stagnant, the tax savings of $500 a year would result in $17,000 after 34 years! As our tax is progressive, where the low income earners pay as little as 2% to no tax and the high income earners pay up to 22% to the government in tax, a person who climbs the corporate ladder would have increasing income, thereby incurring a higher proportion of tax compared to when he was much younger. In some cases, I estimated that the tax savings could be up to $21,000 in 34 years. Anyway, this notion isn’t new, a famous blogger (AK71), who earns more than $165,000 from dividends a year, had been advocating it a long time. Well, if you think a 24% or a $17,000 tax savings is little, wait till you see how much returns you could gain over the years with the additional $7,000 cash contributions you made. *Deduction from Earned Income. Earned Income refers to the taxable earned income from employment, pension, trade, business, profession or vocation less allowable expenses. The amount of relief is based on your age and taxable earned income in the assessment year. For non-handicapped employees below age 55, the deduction of taxable income is up to $1,000. For more information, click here. **Deduction from CPF Contribution. Your portion (not the employer’s) of mandatory CPF contributions counts towards a reduction in taxable income.For every $1 you contribute to CPF, your taxable income is reduced by $1. For more information on the CPF contribution relief click here. To calculate how much CPF you will be contributing, click here. Is A Degree or Diploma Necessary? There have been a lot of articles lately on the mainstream media which talks about private degrees and local degrees etc. In the year 2000, only 26% of Singaporean residents between the ages of 25 and 34 are graduates. Now, more than 50% are graduates. However, the problem is not all 50% jobs in the market are for PMETs, which means many are doing a lower skillset job than what they possess. There is another bigger problem with pursuing a diploma or degree. The problem is the world is moving too fast and the skills you learn in your 3-4 years course may become outdated too quickly. Before we carry on further in this article, I have to clarify that I am not against getting a degree or diploma. In fact, it is a necessary certification to get our first job. What is important is we pick the right courses to study which will ensure the maximum return we have on that certificate which we spend a lot of time and money to obtain. I was in a dialogue session with Minister Chan Chun Sing who was speaking on what the Committee of Future Economy (CFE) is doing. The CFE aims to keep the Singapore economy competitive by helping to position Singapore for the future, as well as identify areas of growth with regard to regional and global developments. One key message I got from the session was that many jobs will become redundant in time but that many new jobs will be created also. The global economy is shifting to a new phase which we, as a small country in Singapore, have to change too in order to stay competitive. In any case, many jobs will be lost regardless if you have a Degree, Diploma or Masters. If you're in the wrong industry, there is a possibility that you will lose your job. In this article, I will explore what are the jobs which will possibly be lost and what are the new jobs which will be in demand. Hopefully this will help us to position ourselves better for our career as well as make better decisions in our education choices. In the 1960s there were a few developments which marked the start of Singapore’s industrialisation programme that began with factories producing garments, textiles, toys, wood products and hair wigs. Along with these labour-intensive industries were capital and technology-intensive projects from companies such as Shell Eastern Petroleum and the National Iron and Steel Mills. Singapore's manufacturing industry evolved to become more sophisticated and included computer parts, peripherals, software packages and silicon wafers. Manufacturing eventually became the largest sector in the economy surpassing trade. Most of the R&D activity were focused on environmental and water technology, biomedical sciences and interactive and digital media. When will I become obsolete? In this era where advancement is moving faster as compared to the past, jobs are becoming obsolete sooner than we think. In the past, jobs may last 10-20 years but now, today's job may be gone tomorrow. I still remembered a few years back when I was still in the army, the first 3G smart phone came out which was from Apple. The first ever iPhone was launched. Moving forward, every year there were new models and the technologies evolved as well. From 3G to 4G and even 5G in the future. Mobile data speed got faster and faster every year. With technological advancement, many industries will be affected which will cause jobs to be lost. We are already seeing it happening now. The question to ask ourselves will be "when will I become obsolete?" Will my job last for the next few years? From the above list, there are going to be various jobs which will be lost. Property/Insurance agents, taxi drivers, retail assistants/cashiers will be greatly affected. Lesser manpower will be needed to perform the same function which machines can take over. This is happening now and it’s happening fast. In our connected world, anybody can take over our jobs in another part of the world as long as it can go through the wire. This was what Minister Chan said. When asking ourselves "When will I become obsolete?" we should see whether our jobs can be done elsewhere in the world. For example, for website programmers/designers, if a designer or programmer in India can do the job, it would be a great risk. We are not just competing nationally but on a global basis. Although some jobs will be lost, there will be new jobs created too. Industries such as healthcare will be in demand due to ageing population in Singapore. It is expected that by 2021, the local manpower will start to fall which means more people will be older and retired. Other industries such as IT/engineering, data/eCommerce and logistics will also be in demand. With IT and wireless communications depended heavily in the future, more professionals will be needed in these areas. Infocomm and cyber security skills will definitely be in demand. Is pursuing diploma or degree necessary? Now, let's get back to the question of whether a diploma or degree is necessary? A degree and diploma is still important but it is also important to consider the career prospect of that education path. The skills which are learnt in the course should be relevant to the industry too. If we are unsure whether we want to study that course, we can actually take modular courses first or take up professional certificates to get ourselves certified. For example, for data analysis, we can take up SPSS or Big Data courses or for project management we can take up PMP courses. Thereafter we still can take up the relevant diploma or degree to further deepen our skills and competencies. The world is changing and in order to remain relevant, we need to re-skill or up-skill and even consider changing industries. The CFE will wrap up its findings by Q1 next year and propose to the government recommendations in order to keep Singapore's economy competitive. We should expect some changes and restructuring thereafter. Word has spread around of a new REIT ETF which has been launched for IPO just last week and closed on 13th October 2016. The ETF will begin trading in the market this Thursday 20th October 2016. REIT has been an all time favourite for Singaporeans as it provides higher than average dividends which is quite a good dividend income for many people. With the new REIT ETF, it will be easier to diversify between different stocks instead of being concentrated with just a few REITs in our portfolio. Phillip Capital invited some bloggers for a dinner and Q&A session on this new REIT ETF just last week. I was there as well to find out more information on this interesting development in Singapore. As we know, investing in funds, such as unit trusts, have high costs that comes with it. However, for ETFs, the cost is relatively lower which makes a difference in our investment returns. The first thing that caught my attention for the REIT ETF is the concentration of properties in Australia. 59% of this REIT index consists of Australian properties with 30% in Singapore and 11% in Hong Kong. 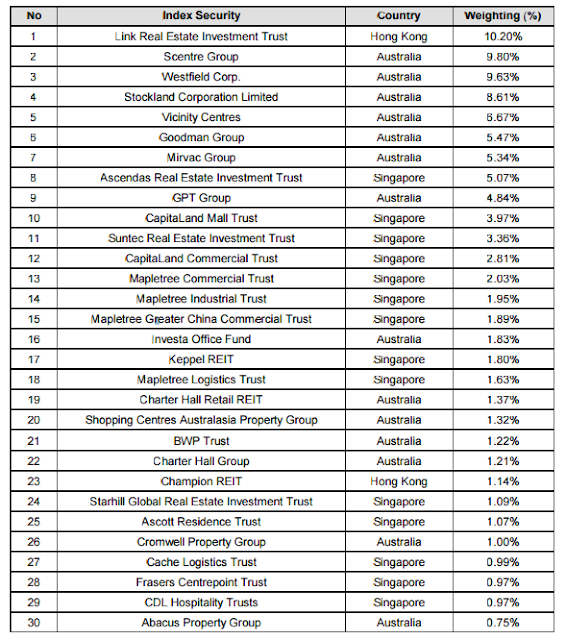 As we can see, the REIT index consists of 30 stocks with the focus on Australian stocks. I asked the Managing Director of Philip Capital why the choice to put more emphasis on Australian REITs and he gave some reasons for it which I will share below. Those are the reasons I manage to capture at the dinner session. I was actually surprised to know that Australia did not have a recession for the past 25 years and their GDP growth is higher than many developed countries, including US and Singapore, with strong productivity growth. Back home in Singapore, we are struggling with weak GDP growth, low productivity rates and weak retail outlook which the government is trying very hard to improve productivity here. In economics, productivity growth tends to increase the salary of workers which increases consumer spending and results in stronger economic growth. This is the reason why productivity growth is so important for a country to do well. Back to the REIT ETF, it is interesting to note that back testing was done for the REIT ETF and the annual compounded return was 13% for the past 5 years. The average dividend yield for the REIT is about 4.5% currently. So far, we have seen a lot of pros in investing in the REIT. How about the cons? The risks are mainly due to the exposure to overseas stocks but if all is well and the AUD goes up plus the economy continues to do well, it will definitely benefit investors who invest in this REIT ETF. To me, this is a medium risk investment which beginner investor should not invest in unless they fully know what it is about. For seasoned investors, this may be an alternative investment fund to get exposure to the Australia market. What do you think of this new REIT ETF? Most of us would have a POSB or DBS account which we will be able to earn cash back from now onward. I just received this information from DBS which I found it quite useful for most of us. With “POSB Cashback Bonus”, we need only to fulfil three or more types of regular banking transactions to enjoy cashback rewards, without the need to make additional deposits. We can earn up to SGD 130 per month via salary crediting, credit card spending, home loan instalments, insurance premiums, or investments. POSB today announced the launch of an innovative “bank and earn” programme which will reward customers with cashback every month through regular banking transactions. This programme is also the first-of-its-kind in Singapore which allows customers to earn straight cashback rewards without making additional funds deposits on their account balances. To enroll in the “POSB Cashback Bonus” programme, simply log on to POSB/DBS iBanking to register, and nominate a deposit or credit card account to receive your monthly cashback. Visit www.posb.com.sg/cashbackbonus for more information on the programme. In 2013, the bank launched the DBS Multiplier Programme to reward emerging affluent customers for consolidating their finances with DBS. With DBS Multiplier, which was recently enhanced in August 2016, customers are able to enjoy a higher interest of up to 2.68% p.a. on their account balances by fulfilling any three of the five transaction categories. The programme has been a hit with customers and the bank has now more than 90,000 accounts. For more information on the “DBS Multiplier Programme”, please visit www.dbs.com.sg/personal/landing/dbs-multiplier/.